Along with the colorful fireworks that light the sky every New Year’s Eve is the silent wish of every person on the planet that 2017 will be better than the previous years regarding career, love life, and family life. Still, no matter how many wishes you make every day from January 1st, if you do not follow it up with persistence and hard work, you will get stuck in square one. 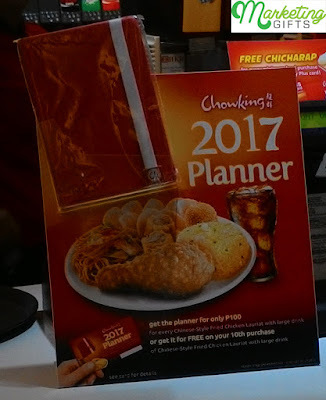 So, the best option is to plan your endeavors and write it all down to the free planner that Chowking is currently giving away. Organization. The new changes you may have formulated in the brain are easy to forget, especially if there are more pressing thoughts in there too. What you need, therefore, is this gift with purchase where you can neatly jot down your future meetings and other aspirations. Uniformity. Some people make a corkboard in which they can pin small notes about everything. The problem here is that the papers can pile up, and the notes at the back will get buried. But if you have the promo gift, such an issue will never occur as you are allowed to write even the littlest detail there. Affordability. Planners tend to cost more than regular notebooks because of the special variety of paper that manufacturers utilize to make such promotional products. Thus, it is great that this marketing giveaway is available for free. Transform the way you advertise your business with the latest advertising strategies from the Marketing Gifts blog.